In the afternoon, cruise to Alphen-on-the-Rhine. In the morning, join us on an excursion for both packages: Excursion to the magnificent Keukenhof Gardens. Outside the opening dates of the park, we'll visit The Hague. Cruise to Gouda, enjoy time on your own or join our hostess for a walk through the city. The morning will be spent cruising. In the afternoon, join us on an excursion for both packages: Guided visit of Delft and Rotterdam. 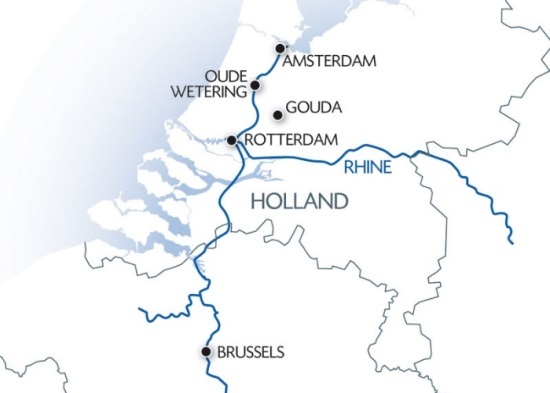 While we are enjoying our tour, the ship will cruise to Rotterdam, where we will board it at the end of the afternoon. Tonight is our gala evening and dinner. Our ship will sail towards Amsterdam through the night. Be carried away by the history of Holland through its culture and the rustic charm of the cities of Amsterdam, Gouda and Rotterdam. During your cruise, you will discover the traditional Delftware, famous for its finesse and the quality of its enamelling.